Parmigiano-Reggiano from Italy ages for two years or longer. 2 What Type of Microorganism Is Used to Make Cheese? 3 What Good Bacteria Is in Cheese? 4 What Is Animal Rennet? 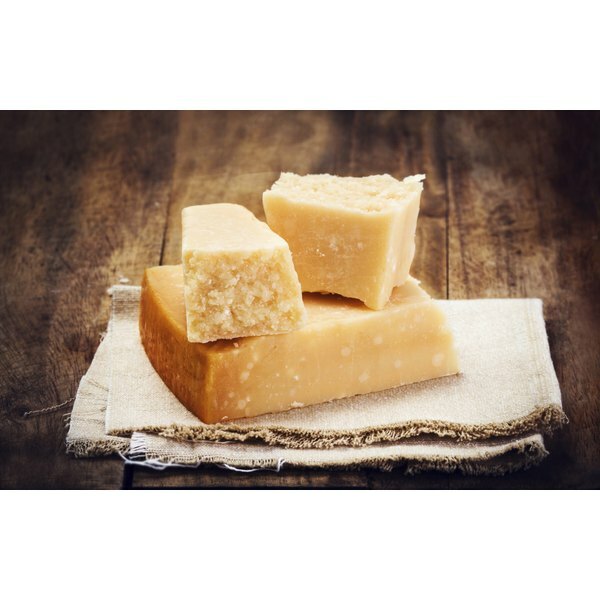 Parmesan is a special cheese variety, originally produced in specific regions of Italy. Although U.S. producers also make Parmesan cheese, the process used does not qualify this cheese for Italian certification standards. Parmesan cheese contains glutamate, an amino acid found in most protein sources. During the cheese-making process, Parmesan's glutamate forms a chemical bond with the sodium and water in the cheese. The end product is a natural form of monosodium glutamate, or MSG. The amino acid, glutamate, provides one of the building blocks of protein. Glutamate is necessary for brain functions, and it affects your metabolism. In Parmesan cheese, glutamate affects the taste, providing a flavor that food scientists describe as umami, the fifth taste. To your palate, this taste is savory or meaty, according to the International Food Information Council Foundation. Because Parmesan is a protein source, it contains several essential amino acids. The amount of glutamic acid is the highest by volume of all amino acids in Parmesan cheese. A 1-oz. serving contains 2.5 g of glutamic acid, according to the U.S. Department of Agriculture. The MSG in Parmesan cheese is a naturally occurring chemical like the MSG that your body makes once the building blocks required to produce it are present. Your body cannot distinguish between natural MSG and commercially produced MSG. The MSG in Parmesan cheese is approximately 12 percent sodium by volume, according to the International Food Information Council Foundation. By comparison to sodium in a saltshaker, this equals 640 mg of sodium for 1 tsp. of MSG compared to 2,300 mg for 1 tsp. of salt. When you consume a 2-tbsp. serving of Parmesan cheese, the total amount of MSG that it contains is 0.05 g, according to the International Food Information Council Foundation. By comparison, breast milk has 0.18 g. The natural MSG found in Parmesan cheese also exists in plants such as tomatoes and mushrooms. A cup of tomato juice has 0.83 g; mushrooms provide 0.09 g per 1/4 cup. The U.S. Food and Drug Administration included MSG on its list of substances considered safe for human consumption in 1980. The FDA's Generally Recognized as Safe or GRAS database does not distinguish between natural and commercially produced MSG. Allergies to MSG are rare, though some populations have reported adverse reactions to commercially produced MSG. Originally extracted from seaweed, some forms of MSG undergo a fermentation process that converts beet sugars, starch and corn to produce MSG. Sensitivity to the base products used in MSG production is likely to be the underlying cause of minor MSG side effects.